Nintendo launched the Switch on March 3 of this year. The system was surprisingly well received. The Legend of Zelda: Breath of the Wild was amazing, plus it was portable, and the Switch has been gaining momentum ever since. There’s just one problem: it doesn’t have a d-pad. The Switch is the first Nintendo console that shipped without one. Sure it had the Pro Controller, the company’s best approximation of the current standard set by Microsoft, but that was not the Switch’s default. What came in the box was a tablet and two Joy-Con, neither of which had a d-pad. Instead, both had a diamond configuration of small face buttons. A, B, Y, X on the right one and up, down, left, right on the other. This oversight certainly didn’t hold the console back in any meaningful way, but it’s something players have still been clamoring about. Almost since the Switch released, people have been attempting to fill the void left by the traditional d-pad’s absence by adding clunky 3D printed replacements. These began with pieces that went over the original buttons and closely approximated the inputs one would expect from manipulating a normal set of directional arrows. They worked well enough that you could pull off a quarter-circle Hadouken in Ultra Street Fighter II without too much trouble, but they still weren’t an optimized solution. There’s a level of friction and tangible resistance to rolling your thumb across a d-pad that analog sticks simply can’t replace. Especially for those of us who grew up with the NES and SNES, there will always be something superior about the feel of opposable flesh against flexible but durable plastic. More recently, a company called Basstop has started shipping Joy-Con cases with built-in d-pads. Since the cross-shaped plastic is embedded in the rest of the shell instead of put over top as had been the case with a lot of 3D printed ones, this newer option is a step forward for everyone dreaming of the day when the Switch controllers will have all the functionality of an original NES game pad. You might remember Basstop as the makers of a special Switch dock that’s small and portable (and doesn’t hide the screen). It required some setup and added technological know-how, but overall people have been satisfied with it. While some people have experienced problems with Basstop shells (incomplete fits that lead to creaking noises), it’s something people desperate for a d-pad might be willing to overlook in the short term. Of course, the easiest solution would just be for Nintendo to release a new set of Joy-Con with the d-pad built in. Being the most familiar with how their own technology works and having no incentive to cut corners and put out a poor quality product, any solution provided by them would likely be the best. 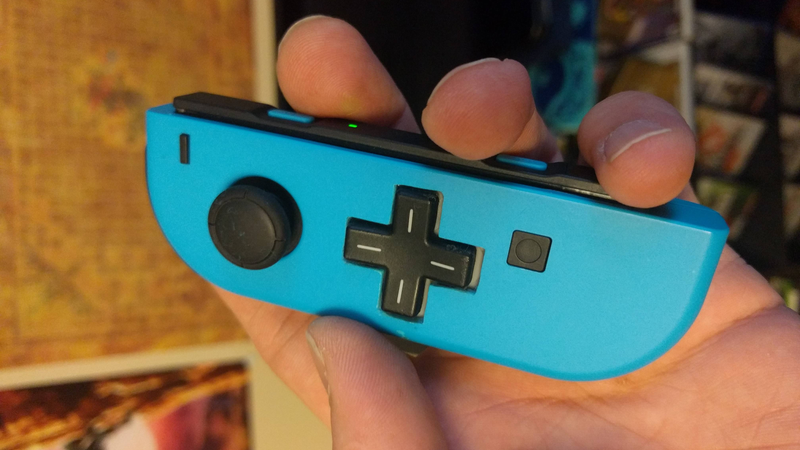 It would also make it so people didn’t have to take matters into their own hands and go to dramatic lengths like one passionate fan did when they fused a d-pad from an Xbox controller over top of the buttons on the left Joy-Con. Basstop’s replacement Switch shell with built-in d-pad. Especially since almost every system prior to the Switch had one. Even the Virtual Boy had a designated d-pad, despite every other problem with that piece of hardware. The only one that didn’t was the original Game & Watch, the company’s first tiny handheld that had more in common with a scientific calculator than a modern gaming console. There are of course other options. As I mentioned above, there’s always the Pro Controller which has a great shape and weight and feels excellent overall. But while it’s great for playing Switch games in docked mode on your TV, it’s not practical for gaming on the go. Neither is Hori’s Pro Pad X, a Pokken Tournament DX branded controller that’s great for fighting games but also not ideal for portable gaming. What is clear, however, is that in the absence of any action from Nintendo, third-party companies and other players will try to fill the void. The Switch is an impressively moddable console, which has in turn led to all sorts of interesting and sharp looking customize iterations of the hardware. Everything from changing the colors of the buttons to replacing entire shells or spray-painting on logos and fan art. And until Nintendo introduces more design options of its own, like Microsoft did for the Design Lab for the Xbox One controller, or make a first-party Joy-Con with a d-pad available, the energetic DIY community around the console is going to continue to try and pick up the slack themselves.